• Authentic U.S. $5 Bill. • Collectible Work of Art, Accomplished Through a Revolutionary Technique. This uncirculated $5 Bill is Genuine Authentic Legal Tender of the United States, which has been holographically enhanced. 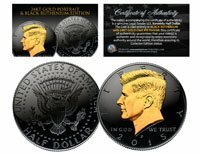 Using specialized advanced technology, the Merrick Mint has permanently transferred the exclusive GOLD DIAMOND CRACKLE HOLOGRAM design onto the $5 bill creating a holographic work of art. When the light strikes the hologram, the light reflects in all directions which photography cannot capture. Included is a blue display portfolio plus a Certificate of Authenticity to guaranty that your bills are authentic and recognized by every monetary authority around the world, and assuring its Collector Edition status. Only genuine Legal Tender $5 United States Bills are used for this unique colorization process. Each $5 Bill is in FRESH, CRISP, UNCIRCULATED condition, and was directly removed from untouched wrapped Federal Reserve sealed packs. The $5 bill features the Lincoln Memorial on the back and Abraham Lincoln's portrait on the front, along with the special hologram overlay.